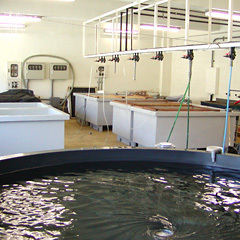 The Fisheries Laboratory in the Graduate School of Agricultural and Life Sciences is involved in research and education for extensive aquatic biosciences. The main focus of this laboratory is to establish a superior breed of fugu, Takifugu rubripes, whose genome has been sequenced and annotated. In particular, much effort has been concentrated on genetics and immunology, in order to identify and characterise genes that participate in disease resistance. The laboratory is located at Hamana-Bay on the pacific coast of central Japan, and is able to supply seawater as well as freshwater to more than 100 rearing tanks of various sizes, ranging from 1 m3 to 100 m3. Our state-of-the-art facilities include sophisticated equipment for gene analysis, cell biology and biochemistry. In addition to biotechnology research, this laboratory is used as the grounds of ecological research of Hamana-Bay, which provides a unique basin environment for extremely rich bio-products. The laboratory welcomes undergraduate and postgraduate students, including those from overseas.